Happy Friday, Everyone, and welcome back to Perfect Picture Books! Golly, it’s fun to get back in the groove, isn’t it? I know some ambitious bloggers kept up with Perfect Picture Book Friday through July and August, but for those of us who have been lazing away our summer on hiatus, what better time then the start of the new school year to explore all the fabulous, fun titles coming out?! Brief Synopsis: Old King Cole stays up so late preparing for his annual ball that when the festivities begin he can’t stay awake! Numerous familiar nursery rhyme characters try to come to his rescue, but only the Queen of Hearts can save the day! Why I Like This Book: As you all know, I am a die-hard Iza Trapani fan, so it is no surprise that I love this latest addition to her stellar collection. 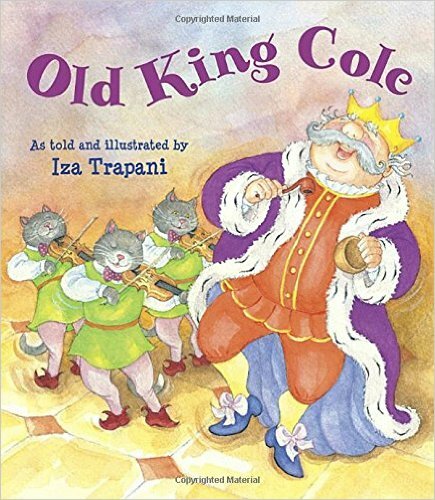 The story is amusing and fun with enough suspense to keep youngest readers wondering whether Old King Cole will EVER wake up. The rhythmic rhyme is fun to read (and sing!) aloud. The illustrations are bright and delightful with plenty of details to keep pre-readers interested, including the ruckus caused by the rooster, Old Mother Hubbard’s dog investigating the treat table, and the goats who take advantage of every opportunity to kick up their heels 🙂 Kids (and grown-ups) will enjoy searching for and finding so many familiar nursery rhyme characters! You won’t want to miss this one!!! PPBF bloggers please be sure to leave your post-specific link in the list below so we can all come visit you! I can’t wait to see what everyone has to share this week after so long out of the loop!